Mass Effect 3 – Behind the Scenes with Pixologic! Of course, the software industry moves at lightning speed, so the tools have evolved dramatically since you began work. How has that impacted you the most? Herbert: Polygon limitation is now a thing of the past because now most software can handle millions of polygons without any major lag. My primary modeling tool for hard surface modeling is XSI and a lot of my models are millions of polygons in my XSI scenes. There is a lot of software to choose from and they all have their own strengths and weaknesses. For example there are now great tools for generating AO, UV’s, etc. It is because of this that I feel character artists spend less time dealing with technical issues, allowing them to focus more on the art creation process. Rafael: Tools that have been developed which speed up the process affected the pipeline a lot. ZBrush tools like Decimation Master, SubTool Master and UV Master are very handy on every model. Most recently, DynaMesh is a very amazing tool that helps a lot when sketching a new idea for a character. Rodrigue: The biggest impact was on time and quality. We can now really go to town with the details on our characters. ZBrush and 3DS Max allow us to work faster, yet also put more and more details and love into our characters with a lot of flexibility. (Layers, etc.) But of course having great high-res models is not enough and you need a good engine with nice rendering and nice shaders to really show all the hard work put into the high-res models. On that side we were very lucky on ME3; we had a very nice budget for the polycounts of our characters and I was able to re-work some of the shaders to add more reflection and sweetness to our armor. If you compare the rendering between ME1, ME2 and ME3 you can see a big jump in terms of character details and quality between each installment. Tools and tech are very important but on top of it the biggest impact for us came from the Art Director and the concept artists. It’s a great feeling to see a new concept and think, “Wow! This guy looks awesome I want to work on it!” and you know that ZBrush and the ME3 engine give you all the tools you need to deliver it without losing quality. You’ve also seen significant advancements in ZBrush since you first started using it. How have those changes affected you? Herbert: Greatly! I remember the first ZBrush version that I used was 2.5. I had to sculpt my characters in pieces because of the polygon limit and there was no SubTool Master or Decimation Master at the time. I sometimes like to generate my normal maps outside ZBrush and my AO with Mental Ray. Without decimation master, getting the best results outside ZBrush was very difficult. The new selection of brushes is awesome as well. With each update, sculpting in ZBrush feels more like sculpting in real clay but with symmetry, undo and “save as” enabled! Rafael: I kind of adapted my workflow when I first started using ZBrush, so all the changes haven’t really impacted my work. But for sure tools like the new DynaMesh, SubTool Master and Decimation Master, sped up my pipeline like crazy. I use DynaMesh a lot to concept new characters and ideas. Decimation Master is a must now for the pipeline in all my projects. Rodrigue: Again, speed. The workflow is getting smoother and all the new brushes and layers give us so much flexibility and creative freedom. One of my favorite parts is the sculpting feel. I don’t feel like I’m moving points around anymore. Now I feel like I’m actually sculpting. That feeling is great and because it’s so fun I try to stay inside ZBrush as much as I can. How much were you able to carry forward from ME2? Was there anything that you significantly re-worked like what you did for the Salariens with Mordin? Rafael: We had to re-work almost all the assets we used from ME2. I had the pleasure to re-design the Keeper and Rachni Queen. I did this by using the same base model and with ZBrush I changed all the details and textures. For other models like civilians and romance bodies we added more details on top of the existing models using ZBrush and re-working normal maps and textures. 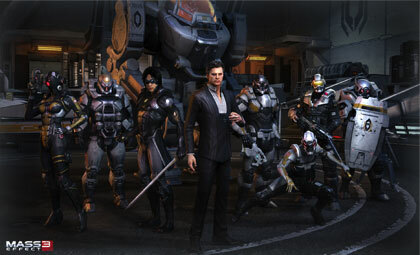 How did you use ZBrush for Shepard and his squad? How was it beneficial for things like armor? 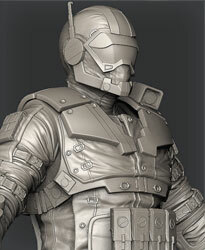 Herbert: For the humanoids armor, ZBrush was used mainly for the cloth and rubber areas. Rodrigue: We used ZBrush on all the faces, but also on most of the armors for the cloth and leather parts. 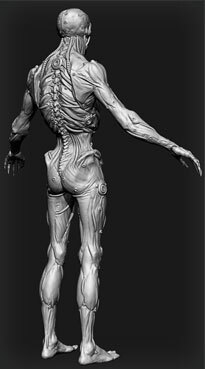 In ME1 all the folds were modeled in 3Dsmax and were very basic but with ZBrush we were able to bring greater realism to our more organic parts. What are the advantages to using ZBrush for concept creation as opposed to traditional methods like going from a drawing to the game’s base mesh and then finally to detailing? Rafael: With ZBrush it is really easy to play with shapes and try different designs. The best thing about doing concept creation in ZBrush is that you have a base to start modeling on top of or a 3D feeling for how the character will react later with skinning and with the other characters in the game. On the other hand, it’s really slow to do a lot of major variations. So if you don’t have a base idea to start sketching in 3D the work can become useless in the hands of the art director. Rodrigue: I used ZBrush on some armors to quickly test designs as well as different shape and size variations. It’s really fast, especially when the team is not sure about a specific design. With ZBrush you can quickly make 3D propositions to show to the Art Director and the rest of the team. Seeing the design in 3D helps to make decisions; a 2D concept can be interpreted differently depending on who looks at it but with a 3D model it’s easier to get everyone on the same page. With the various Reapers you really got to go all out creatively. How did ZBrush help with that? Rodrigue: These guys were a lot of fun. We had concepts but they weren’t precise. The team really wanted us to have more room with these guys and they are the characters that the 3D artists changed the most. We really had the opportunity to just let loose in ZBrush and let the sculpt talk. After so many armors, it was great to be able to go with an all ZBrush sculpt on these creatures. The Cannibal, the Banshee and the Brute had multiple revisions based on gameplay requests. Using ZBrush, we were able to quickly make them and propose different solutions. What techniques in ZBrush do you find work best for detailing characters? Rafael: ZBrush has a lot of brushes that truly help the detailing process. I don’t find myself playing a lot with alphas and other tools. Only brushes and patience are needed to handle the job. Rodrigue: Like Rafael, I mostly use simple brushes and a lot of work and patience. But I would say that sculpting layers are still my favorite tool in my pipeline. I sculpt almost everything on different layers. With that I can boost or reduce the effect of my sculpting or delete it and do something different. Or I can close the mouth of a character or re-size the arms and quickly show the difference to the Art Director. I do use alphas and Drag-Rect once in a while. Or in the case of faces I texture them and then convert the texture to a mask and use that mask to add some details. When I do use these two techniques I always do it very subtly and add most of my details by hand. It’s just the best way to get exactly what you want. This is probably your last chance to speak as a team to the ZBrush community. Is there anything else you’d like to say while you have our attention? Hertbert: Big thanks to Pixologic to keep updating ZBrush with awesome new features, ZBrushCentral is a great forum for people to get inspiration and feedback to keep growing as artists. So keep posting! Rafael: ZBrushCentral for me is one of the best communities online. All the tools you need to learn are available online. Keep studying and building your portfolio because we always keep an eye on ZBC! Rodrigue: Keep rocking, Pixologic! Every new release is amazing and the ZBrush community is huge and full of awesome artists. What you do is great, so continue doing it. And to all the characters artists out there: like Rafael said, we always keep an eye on ZBC. If you are interested in more information on this product or to buy ZBrush click here. 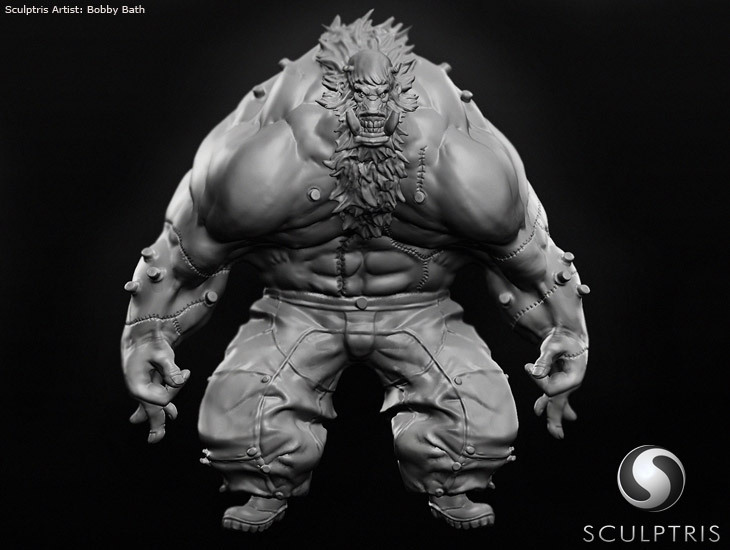 Pixologic, maker of the Award-Winning ZBrush yesterday announced the latest release of Sculptris (for Windows and MAC). For the last decade Pixologic has been recognized for its ground-breaking innovation, “cool” creativity and tools that are as user friendly as they are powerful and natural-feeling. These tools enable artists in many industries to open new vistas of possibility with their skills and imagination. 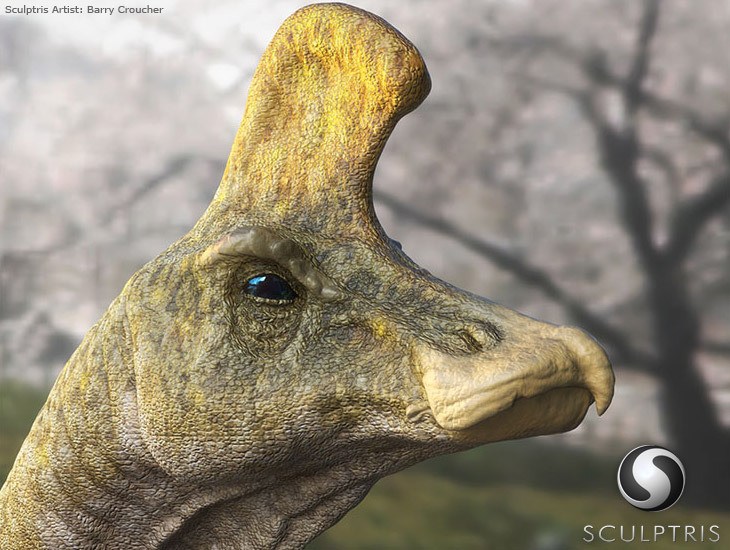 The development and latest release of Sculptris is consistent with the Pixologic ethos and spirit to help artists both shine at and enjoy creating art – intuitively, without having to worry about technical barriers. Sculptris is an elegant and simple 3D modeling solution, offering artists a platform to harness their imagination and create 3D sculpts in a way that is unique to the digital world. Sculptris introduces a dynamic tessellation system, giving its user the ability to sculpt or paint freely on any part of the surface without having to worry about the underlying geometry. With Sculptris, triangles are automatically added as needed, and only to the areas where a stroke has been applied to the surface. Users can do just about anything that’s possible with real clay. For example, they can pull, twist and pinch the surface, easily adding volume as needed without the rigorous attention to underlying structure that is typically associated with 3D modeling programs. Pixologic envisions Sculptris as an entry level scultping tool for a new generation of artists wishing to explore 3D sculpting and digital creation. Fun to use, it’s also a truly effective programme that can be embraced by hobbyists and professional artists, alike. For those wishing to explore further, Sculptris is seen as a perfect base upon which to build one’s skills while advancing to the substantial world of ZBrush. With the new GoZ integration in Sculptris, artists can now seamlessly move their creations between Sculptris and ZBrush with the click of a button. The navigation controls in Sculptris have been enhanced from earlier releases of the software and are now similar to those in ZBrush. This makes it effortless to go between the two applications while also helping Sculptris to serve as a stepping stone toward mastery of ZBrush. The new version of Sculptris is currently available as a free download at: pixologic.com/sculptris. Experienced Sculptris users and first timers alike are encouraged to try out the new release, have fun playing with it, and most important—make great artwork! All are invited to share their creations in the Sculptris forum at ZBrushCentral. The forum provides a common ground for Sculptris artists to share and communicate with other Sculptris users, as well as the many industry-leading artists who frequent ZBrushCentral. e-on software, maker of the leading solutions for Digital Nature, pre-released today Vue 9.5 xStream and Infinite, its professional solutions for the creation, animation and rendering of natural 3D environments. Vue xStream and Vue Infinite are the company? ?s flagship solutions for the creation of natural 3D environments. Vue Infinite operates as a standalone application while Vue xStream works seamlessly inside 3ds Max, Maya, Softimage, LightWave and Cinema4D. Specifically designed for graphics professionals, these products combine a multitude of cutting edge features that easily integrate into existing production pipelines. Custom Star Maps: custom ? ?deep space?? maps can be loaded as an alternative to the standard Vue stars. Users can even load images of distant constellations. Site licensing discounts are available, contact CAD Software Direct for further details and pricing information.